How someone responds to a partner’s good news can have dramatic consequences for the relationship. 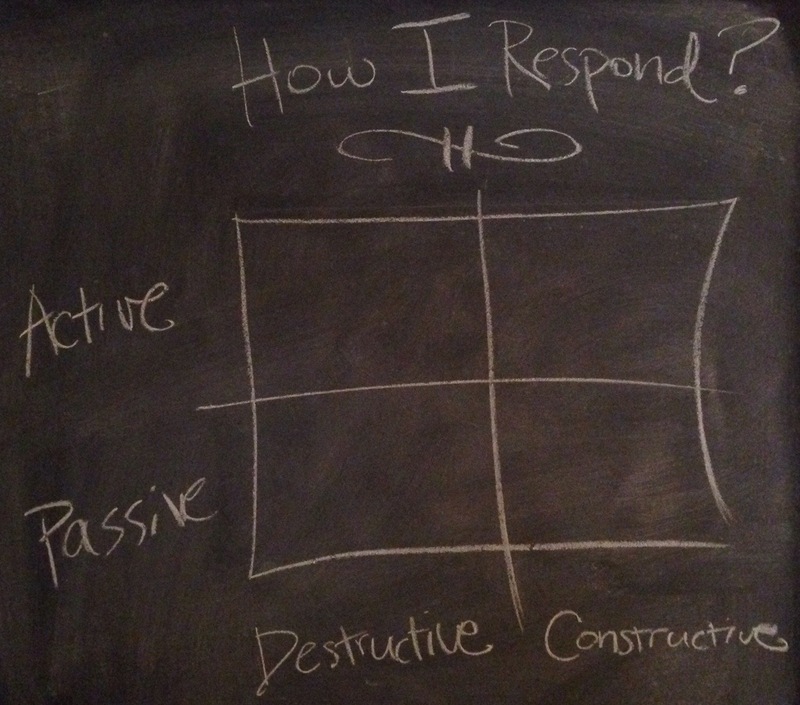 Graphing your responses on a quadrant of passive vs. active and constructive vs. destructive, where do your typical interactions lie? You’d think people who care about each other would avoid actively destructive responses. It happens a lot though, especially if one spouse is jealous or anxious: “You got accepted to your program? How are we going to pay for that! ?” Or, “Ugh! Why do you get all the luck? I’m sick of you being happy all the time!” That doesn’t sound like your relationship? Good. But passivity is a thing too. Consider the silent eye rolls, the averted glances, and refusals to acknowledge each other. Even being passively supportive isn’t great for relationships, because it’s a bid for connection that gets missed. An “ehhh, that’s nice” is a bit like the emotional equivalent of offering a handshake or a hug, and being given a nod or a wink instead. Think about how that feels! And we’d think, “I never do that!” But how often are we just too zoned out to even realize our love or even our child is trying to connect? So what to do instead? What if you are listening but the news doesn’t really excite you that much? Do we have to fake it in order to be actively constructive? No. PS: The geek in me sacrificed much by leaving out its convoluted analogies of proper modem handshakes, ACK, etcetera. You’re welcome.